What's Going On for the Elderly in Acton? Over 50 and Interested in Art? On Church Road W3, we find an expectant gathering of elderly people. A large number of locals sit at tables in an airy hall waiting for the event of the day - Bingo. Others are grouped around chatting, some in other rooms play dominos and there is a well equipped studio where a few people are creating pottery. Other activities available in the Day Centre include Indoor Bowls, Dancing, Arts and Crafts, Chair Exercises, Current Affairs, spruce up sessions, fellowship groups,a Polish Club and an Irish Club. 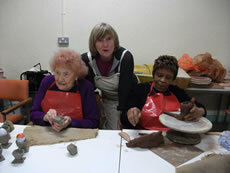 Jane Willingale, a local artist, holds a pottery class every Friday and her students are enjoying their regular session. 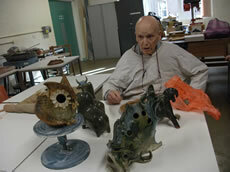 One, Peggy, is quietly and expertly creating one of a number of egg cups. It is only later on that we are told that Peggy is blind. Another of Jane's students, a feisty Polish 89-year-old called Les has brought along some of his beautiful pottery creations to show us. His wife sits apparently dozing in a chair but is quick to interject when she feels his explanations lack substance. We spoke to Jane about her experience as a volunteer. She told us: "It's very hard work but it's worth it to give these lovely people something to do with their time apart from playing Bingo. Some of them are very talented already and some may have hidden talents which have not been explored yet. I would love it if more students wanted to join the class." She continued: "They are always very excited when the final firing gets taken out of the kiln and they get to see the finished items. We had a great success with some Christmas decorations which were sold to other Michael Flanders and Age Concern clients. Right now, Peggy is waiting with great excitement as to how her egg-cups will come out. "There's lots of fun activity here - I have particularly enjoyed playing bowls - despite the fact that another volunteer and I managed to score nil which was the first time anyone had had such a low score. "They also do something called sequence dancing on Tuesday afternoons. This is very popular and is like another version of ballroom dancing where you all do the same steps. It's lovely to watch. "There is also cookery - people love baking and this is also very popular." We also spoke to Phyllis (89) who visits the centre on Tuesdays, Thursdays and Fridays. She told us that bingo is a "big attraction, but dancing is also popular." We hear later that students from Acton High School are to visit the centre with laptops and 'dongles' to give a beginners' computer class. In May last year, Age Concern Ealing and the Michael Flanders Centre joined their resources together in the same building to provide a more comprehensive resource for the elderly - a 'one-stop shop' where everything would be found under one roof. 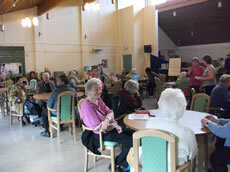 Age Concern Ealing also has another Day Centre in West Ealing. Between them, Michael Flanders and Age Concern offer a huge range of activites and support for elderly people in need of help - whether this is because they are isolated or disabled or have other problems like learning difficulties. This is a valuable resource for all older people in Ealing Borough. Age Concern Ealing service users can visit the centre up to five times per week. They come for social contact, support and the activities on offer. Michael Flanders clients are allocated social workers by Ealing Council. Most Age Concern clients do not have social workers so Age concern does the case work. However if needed they will refer to social services. These clients tend to be people who need rehabilitation, or are experiencing social isolation problems or problems with disabilities. Some elderly people can be very isolated, some may be disabled. Referrals to Age Concern might come from a neighbour or a friend. The client will be assessed and then if their problems are too complex, they will be referred to social services or in some cases to mental health. Age Concern carries out a series of reviews on their clients over a six week period. Age Concern Ealing reception provides access to their other services such as Telecare, Fallsafe and general advice and information. Clients tend to visit for the day, rather than just for lunch which is provided at the reasonably priced café. In the centre, there are two rooms available for advice services. There are regular advocacy surgeries (for appointments call 020 8825 7875) and Pensions advice from the Department for Work and Pensions. There is also a welfare benefits surgery and plenty of community safety advice with regular visits from the local police. Also available are the very popular therapy rooms where clients can have acupuncture, holistic massage, reflexology and shiatsu and other therapies for only £12 a session. The Centre has the potential to be a really good resource for the elderly but building up so many different activities takes time. The range of activities and therapies on offer is expanding all the time. As well as the day centre there is a reasonably priced café providing freshly cooked food. Karen Robinson, the Day Services Manager who shows us round says that they are always looking for volunteers to help on the reception desk, help in the café, to work in the Day Centre and possibly to help with activities, too. Age Concern Ealing provides a telephone support service available for those who are housebound. The phones are manned by volunteers. Notes are kept on a database to give a comprehensive picture of everyone registered. If there is no reply, police can be called to provide any necessary assistance.